GRAVENHURST — Muskoka history isn’t trivial, but it is fun. And that means testing your memory of local lore. 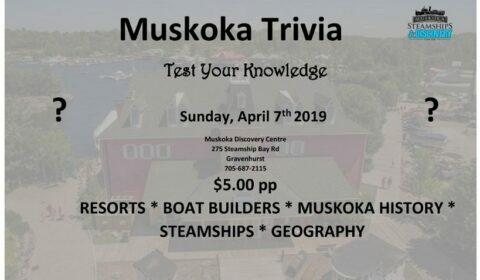 This Sunday afternoon, April 7, archivist Mary Storey is hosting the Muskoka Discovery Centre Trivia event at 2 p.m.
It’s $5 to get in. What is the first name for the Port Carling rapids? What two men began an air service between Toronto and the Royal Muskoka Hotel in 1920? What resort was renamed Canadian Keswick in 1926? If you have any questions about this event, call Mary Storey at 705-684-9560. There will be a test … to see if you know your local lore.